The idea of a coalition government took centre stage on the first day of the federal election campaign Saturday, with Michael Ignatieff vowing not to form one despite Conservative Leader Stephen Harper's warning that his Liberal rival would make the "reckless" move. Stephen Harper clearly tried to seize power through a coalition agreement after coming second to Paul Martin's Liberals in 2004, Bloc Québécois Leader Gilles Duceppe charged Saturday at the start of Canada's 41st federal election campaign. Duceppe held up the letter to the Governor General he said Harper signed as Official Opposition leader to Martin's government. Duceppe and Layton say they got together with Harper and drafted the letter to tell then-Gov. Gen. Adrienne Clarkson that Harper was prepared to form a government if Martin lost the confidence of the House of Commons. "He finished second in that election," Duceppe said in French. "If he says that's undemocratic, well, that's exactly what he was asking for. So let's not play games with history. He has to take responsibility." Harper has been hitting the opposition leaders hard over what he says is a plan to form a coalition government, a message he repeated outside Rideau Hall Saturday morning. Harper said that on May 2 Canadians will make a choice between a "stable majority" Conservative government or a "reckless coalition." He was adamant that if Canadians don't elect a Conservative government, Liberal Leader Michael Ignatieff would form a coalition government with the other parties, including the Bloc Québécois. "That is a risk that our country cannot afford," he said. Harper said the only thing those parties would agree on is raising taxes and spending more money. Ignatieff painted it as a choice Canadians have between a Liberal party devoted to people or a Conservative party contemptuous of democracy. Standing with a group of Liberal MPs just outside the Parliament buildings on a frigid day in Ottawa, Ignatieff challenged the idea Canadians don't care about what happens inside the House of Commons. "We are here because yesterday, something happened that had never happened in the history of our democracy," he said. "The prime minister lost the confidence of the House because he was found to be guilty of contempt for our parliamentary institutions. And that's why we're having an election. "The Harper winter will soon be over." Ignatieff tried to take the focus off the question of whether he would form a coalition after the election. He released a written statement before Harper could announce the writ drop. He said he won't try to form a coalition with the Bloc Québécois or with any of the federalist parties. Harper was having none of it though, insisting at his press conference earlier that Ignatieff would go ahead with a coalition anyway and accusing Ignatieff of having a "hidden agenda." Ignatieff says he's been clear all week. "I want to completely rule out a coalition," he said. "This is an election about democracy. The Canadian people are owed clarity, clarity of purpose on this. I made it clear all last week I want to form a Liberal government ... Mr. Harper thinks I don't understand the rules of democratic life, I understand them better than he does." 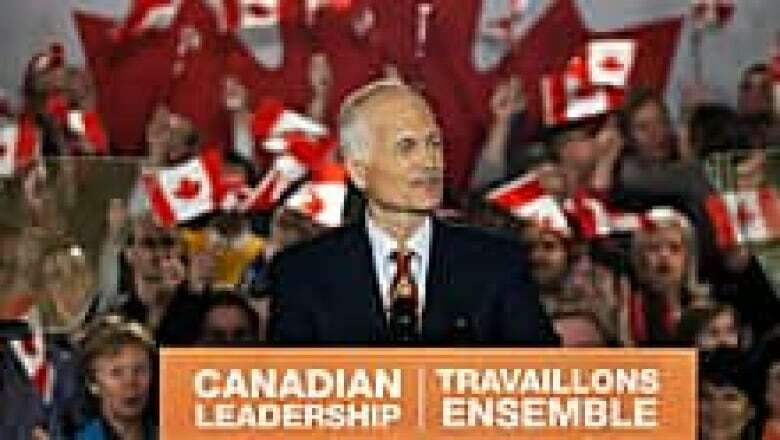 NDP Leader Jack Layton addresses supporters as he starts his election campaign in Ottawa on Saturday. Andrew Vaughan/Canadian Press At NDP Leader Jack Layton's first rally of the campaign, he didn't use the word "coalition" but made it clear that his party is willing to work with the others. "I'm asking for a mandate to lead the next government. And if that turns out to be a minority government, as prime minister you can count on me to reach out to all members of parliament who believe in building a better Canada," Layton said with a crowd of supporters cheering behind him and waving small Canadian flags. "And together, we will provide an alternative to a Harper-led government, whether it's in a case-by-case basis ... or more stable arrangements. I will work with the mandate you give me." Although he spoke about working with the other parties, Layton still took shots at his political opponents in his bid to Canadian voters. Stephen Harper must be replaced as prime minister, not just prevented from getting a majority government, Layton said, and he doesn't blame traditional Liberal voters for having doubts about Ignatieff, he said. "Mr. Ignatieff saying one thing and doing another is not Canadian leadership," Layton said, without giving examples. Layton pledged to fix what he says is broken in Ottawa and bring an end to divisive politics. Green Party Leader Elizabeth May launched her party's campaign in the Vancouver Island riding she hopes to win. "Canadians look at Parliament and what they think is, we have had enough," she said. "We've had enough of a culture of endless negativity. Enough of the abuse of our traditions. "We cannot stand by and let our government, our democracy, be abused." May is running in Saanich-Gulf Islands, a B.C. riding she hopes to wrest from Conservative minister Gary Lunn. P.O.V. : Do you vote for the candidate, the party or the leader?